If you are thinking of having commercial premises painted, one of the first things you need to consider is the level of disruption to the business itself. If you deal with members of the public each day, you have to consider how this may impact on them. If you run a business like a hair salon, clients are not going to want to have a painter working around them while having their hair done. As a consequence, many professional painters and painting businesses will offer to work outside normal office hours. This will lead to minimal disruption to your business even though the cost will be higher than if the work were to be done during the daytime. Painters who work on residential property should have public liability and accident insurance up to a value of approximately £5 million. However where commercial premises are concerned, this liability will usually have to be increased substantially. You will need to agree in advance the level of insurance cover your painters will need to have. When choosing a painter for your commercial premises, they will need to have a good understanding of the environment. Some commercial premises are just an office where staff come and go once a day while others have up to 500 customers coming through the door each day. Commercial and industrial paints can be appreciably different in their constituents depending on the amount of wear they are likely to get. Seldom are two commercial premises the same, so if you are considering having work done, why not use our easy to complete form and arrange to get some quotes from professional local decorators who can discuss a suitable strategy with you to minimise the impact on your business while it is being painted. Also go to 'What to Look for in a Quality Painter?' and Cowboys Painters. 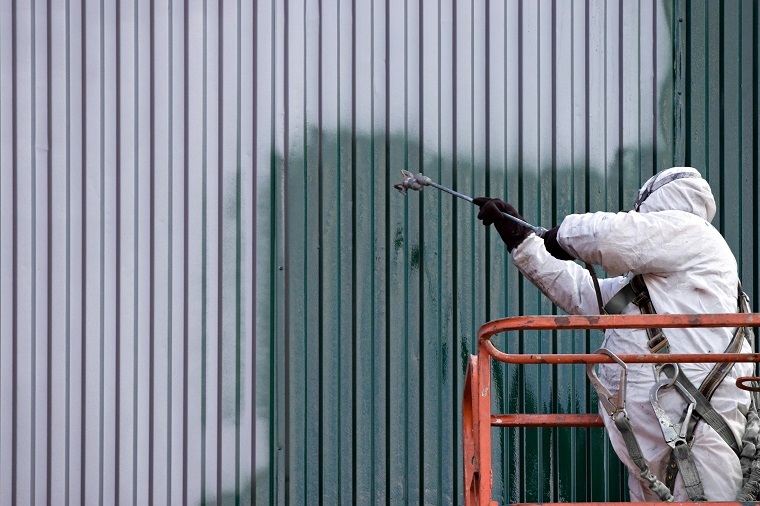 In this video, a company abroad is repainting the exterior of a commercial property. Watch the video to get an idea of how such buildings are painted.